Gosh, I really liked watching Mr. Bean in the past. I had a few videotapes I watched endlessly. 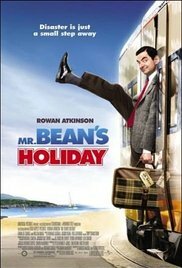 And Mr.Bean’s Holiday is just a continuation of that period. I enjoyed the subtle, visually strong jokes and situations enormously. Despite the fact that this little, clumsy fellow always makes me nervous because it goes wrong every time. He misses a train. He misses a bus. His ticket gets stuck to the leg of a chicken. The chicken runs away of course. Or he’s hitchhiking along the road for a long time already and then he gets locked up in a cabin. And that’s when eighty cars, a bus and a van passes that spot. And so on. And so on. And yet I can’t resist looking further and chuckling about this. 2. The musical mime on the village square. Magnificent. Cleverly put together film again. Only the end in Cannes was a bit exaggerated with Willem Dafoe, but the final scene on the beach was a brilliant ending. Karel Roden (from “The Bourne Supremacy“) had a surprising role and Emma de Caunes was perfectly casted.